In the strategic debate over Afghanistan, two opposing schools of thought have emerged. The first asserts that a durable victory requires a functioning, legitimate, and representative nation-state; the second contends that U.S. national security concerns can be satisfied without committing to a wholesale restructuring of the country. The predominate school advocates surging ground troops and deeper national commitment; its counterpart seeks solution through long-distance punitive strikes using cruise missiles, unmanned predator drones, or raids by special operations forces. Accounting for some 42 percent of Afghanistan's 29-million-strong population and concentrated in the east and the south of the country, the Pashtuns have dominated Afghan policies since the country's founding in the mid-eighteenth century. 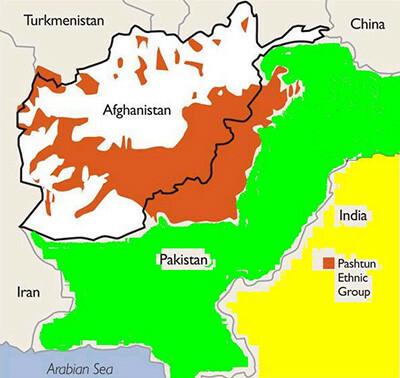 Above, brown shading represents Pashtun regions. Limiting the strategic response to whether America is either spending billions of dollars and suffering thousands of dead to restructure whole countries or is a distant sword bearer antiseptically raining down death and destruction is, however, a false choice. Washington's challenge is to field a decisive and cost-effective global strategy implemented by successful tactics to bring a durable victory. To be sure, Afghanistan is a seemingly intractable problem. Throughout history, dozens of foreign armies have marched into the country—from the ancient Greeks and Persians, to the Mongol hordes, to British, Russian, and Soviet occupiers. None of them remained, and the legacy of their battles and campaigns has not been empire but an indigenous Pashtun tribal structure and culture, refined and honed over millennia for fierce resistance against invaders. The Pashtuns are permanent in the region. The Americans are not. The Afghans will wait out this latest incursion as they did those by every foreign invader since Alexander the Great. Unless Washington adopts a new and imaginative strategy that will separate the Taliban from the Pashtun tribes, the U.S. footprint in Afghanistan is bound to disappear with no lasting legacy. carefully targeted actions … designed to disrupt the use of Afghanistan as a terrorist base of operations and to attack the military capability of the Taliban regime … Every nation has a choice to make … In this conflict, there is no neutral ground. If any government sponsors the outlaws and killers of innocents, they have become outlaws and murderers themselves. And they will take that lonely path at their own peril. This goal was reaffirmed in "The National Security Strategy of the United States," the Bush administration's strategy document, published in September 2002, which sought to "disrupt and destroy terrorist organizations by … denying further sponsorship, support, and sanctuary to terrorists by convincing or compelling states to accept their sovereign responsibilities." Phase one. Beginning as a counterinsurgency campaign, OEF quickly developed into an offensive war of maneuver where massed Northern Alliance militias advanced to engage the Taliban in open battle. OEF phase one was waged unconventionally—utilizing the Taliban's local rivals and supported by the CIA, Army Green Berets, and U.S. air power. It toppled the Taliban regime in a rapid and cost-effective manner that was over to all intents and purposes by December 20, 2001, when the U.N. Security Council established the British-led International Security and Assistance Force (ISAF) "to assist the Afghan Interim Authority in the maintenance of security in Kabul and its surrounding areas." Phase two. Characterized by a logistical buildup and strategic defense waged through a conventional war of attrition, the second phase began with Operation Anaconda in March 2002 when more than 1,000 U.S. soldiers conducted fierce firefights in the Tora Bora region, inflicting hundreds of casualties on the Taliban, their Pashtun tribal backers, and their al-Qaeda allies. For all its achievements, Operation Anaconda was not decisive. It did not, in any strategic sense, destroy the enemy's forces, seize their terrain or populations, or break their will to fight. Quite the contrary in fact, it marked the beginning of the strategic defense as U.S. forces failed to pursue the enemy over the Pakistan border, thus enabling the creation of sanctuaries in that country's Northwest Frontier Provinces and the Federally Administered Tribal Areas from which the Taliban would carry out sporadic and diffuse guerilla operations. Imposing a conventional framework on what had been a chaotic unconventional campaign, the new strategy involved the construction and expansion of ISAF bases around the country as the force grew from its initial 600-strong size to the current 131,700. Numerous tactical operations were launched. The Afghan national government, army, police and border forces were created. Twenty-six provisional reconstruction teams were dispatched to the provinces. Civil and public works were commissioned and funded by the international community. The shift from a tribal-based counterinsurgency to a conventional Western diplomatic and military framework was an abrupt and radical change for Afghanistan, not least since the modest strategic goal of denying al-Qaeda a base of operations gave way to compelling the Afghan government to enforce its authority over the country's tribal entities—something that had historically resulted in insurrection. Small wonder, therefore, that the latest imposition of modern state structures on this tribal society generated a reaction that served to unify and motivate current and possibly future generations of Pashtuns against U.S. forces, their allies, and the Afghan government. For most Afghans, the U.S.-backed Hamid Karzai government has been as much a foreign implant as the Soviet-backed communist governments; its military operations in the provinces are almost as foreign an exercise as Western interventions. The ISAF's tactical successes notwithstanding, the Taliban continued to attack and did so in increasing numbers. The conventional war of attrition focused on kinetic operations against enemy forces in Afghanistan to the exclusion of Pakistani sanctuaries, militant madrasas (Islamic schools), and Pashtun tribal and religious imperatives. Moreover, it mismatched U.S. tactical advantages of speed, communication, and firepower against Pashtun strategic advantages of permanence, religious and tribal will, moral purpose, local knowledge, language, and culture. The ISAF could inflict cumulative casualties numbering in the tens of thousands on the Taliban without deterring them, their Pashtun tribal backers, or their al-Qaeda allies. The reason for this is simple arithmetic. The total fertility rate—the average number of children born to a woman over her reproductive lifetime—in the Taliban's sanctuary of Pakistan's Northwest Frontier Provinces is 5.1; in Afghanistan, it is 6.6. If these rates bracket the actual rates on either side of the border, the provinces' population of eighteen million doubles every eleven to fourteen years, providing some eight to nine million additional males for jihad. This regenerative capacity trumps any casualty rate the ISAF can inflict on the Taliban in Afghanistan. The Taliban needs to protract the conflict in order to realize its strategic advantage provided by birth rate. The ISAF's strategy not only provided that time but also surrendered the strategic offensive to the enemy, which could decide at its leisure if and when to engage. Ultimately, the second strategy failed because it lacked a way to convert tactical gains into strategic victory. The ISAF's tactical-strategic disconnect manifested itself in emergent bad habits; timid generalship allowed force protection where avoidance of casualties is a predominate strategic objective. It fixated on personalities, not war goals. Remote, periodic culling of the Taliban's leadership through Predator drone strikes and commando raids achieved "silver bullet" status for a command substituting tactical body and bean counting for strategic gains. In order to address the situation in Afghanistan, we will implement a comprehensive counterinsurgency approach that works to defeat existing insurgent groups, develops the institutions required to address the root causes of the conflict, maintains relentless pressure on terrorist organizations affiliated with the insurgency, dismantles illegal drug networks, and prevents the emergence of safe havens for those transnational extremist groups … A properly sized, trained, and equipped Afghanistan National Security Force is a prerequisite for any eventual drawdown of international forces from Afghanistan … In addition, we will bolster the capabilities and the legitimacy of the other elements of the Afghan government—an effort in which, in much of Afghanistan, we will be building, not rebuilding. While maintaining most frameworks of the second phase, this strategy avoided the pitfall of a conventional war of attrition by employing a comprehensive counterinsurgency approach. The strategic goal of compelling Afghanistan to exercise sovereign control over its territory remained preeminent, and open-ended direct tactical engagement remained the means. Petraeus specifically mentioned an endpoint where ISAF's security responsibilities would be transferred to the Afghans and its forces drawn down. The question is whether a foreign war can evolve, or devolve, into a purely Afghan war. The United States and its allies have been battling the Taliban for nearly a decade, to no conclusive effect. While having a wide spectrum of responses and capabilities, they have relied almost exclusively upon direct tactical engagement, ignoring for the most part soft power, whether religious, economic, social competition, or co-optation. Yet armed force is only one means to defeat an adversary. In order to execute a successful war in Afghanistan or elsewhere, the West must broaden its approach, initiate new methods and remove failed ones. The minimum goal must be to preclude the establishment of armed Salafi Islam in failed nation-state sanctuaries or defeat it locally where it threatens U.S. or Western national interests. Ultimately, this will require the removal of Islamism's hold on targeted tribal societies although this cannot be directly achieved through external intervention but rather through a decisive engagement between indigenous constituencies. As such, Western nationals, whether armed or nongovernmental organizations, are not part of the permanent solution. Specifically, the key to victory lies in the reformulation of Afghanistan's Pashtun village society to the extent that it not only rejects Salafi Islam as its sole or preeminent organizing and motivating principle but also invigorates competitive forces—political, cultural, religious, economic, and ideological—capable of superseding and/or replacing the Salafi interpretation of Islam in those societies. Such natural competitors must create in-place, multigenerational societies, whose opposition to radical Islam is self-maintaining, self-replacing, and self-organizing. Their emergence requires that the West alter the predominance, range of control, and the depth and balance among these natural forces, elevating certain constituencies and diminishing others, without forgetting for a moment that these are native constituencies and are not proxy forces dependent upon foreign support and intervention. The advantage of societal reformulation is that it uses existing constituencies, operating within natural parameters and constraints, which precludes the cost of introducing, preparing, and educating societies on foreign concepts; decreases the probability of rejection; and also reduces the probability that natural competitors are co-opted and used against U.S. and allied forces. Also, the use of existing constituencies decreases the need to deploy Western forces in direct tactical engagements. Lastly, evolutionary and consistent reformulation, rather than abrupt radical transformation, avoids supplying reactionary elements in society with a rallying focus. Reformulation of a targeted society takes place within that society's natural operating parameters and constraints. In the case of southern Afghanistan, local Pashtun village society operates within the Hanafi school of Sunni Muslim jurisprudence and Pashtunwali indigenous traditions of the region expressed through narkh, a Pashto word meaning informal or traditional laws and rules. Qawm (Dari) is a densely layered weave of constantly renegotiated, local, and social solidarity networks. Manteqa (Pashto) is a self-identified, culturally uniform, shared-geographic space, usually based around clusters of small villages. Together, they articulate the depth, range of control, predominance, and balance among natural and traditional Afghan constituencies. The straightforward integration of local village society to the central state will be no mean feat. The qawm networks have historically been inaccessible, if not hostile, to the imposition of external, hierarchical control, all the more so to a central government seeking to impose a Western-type state run by English speaking, transnational elites and backed by foreign troops. Current village-based counterinsurgency programs such as the Village Stability Program, Afghan Public Protection Program, Community Defense Initiative, and Local Defense Initiative that operate through shuras or jurgas (local or tribal consultative councils) will either be co-opted by a large repertoire of local interests or rejected because, at their core, they are antithetical to qawm and manteqa interests. Short of a fundamental restructuring of the Afghan state, therefore, the solution is to construct an intermediate edifice or interface between the antithetical aspects of the Afghan state and village society. This structure should be able to directly access qawm networks, migrate them to the central state over time, fight the sectarian war, and stabilize the village system. This requires that the predominance, range of control, depth and balance among the networked constituencies that make up village society is altered, elevating some and diminishing others. This intermediate structure must be evolutionary, rather than revolutionary, so as to preclude a reactionary backlash. It should, moreover, isolate and atomize those links Salafists use to access the village society's social structure. Admittedly, the situation in Afghanistan is chaotic. The central government does not possess an established, widely trusted, or accepted capacity for institutional governance and is challenged by numerous warlords and heavily armed tribes dotting the Afghan and Pakistani landscape. Co-opting and making them enemies of Salafi Islam and allies of the national government will be difficult, but there are historical precedents for long-term success. The most directly applicable is the "internal imperialism" of Amir Abdurrahman (1880-1901), aptly named the "Iron Amir," who consolidated previously independent tribes under central government authority. Likewise, Zahir Shah's long and peaceful reign (1933-73) was largely due to its co-optation of and cooperation with village society: He successfully maintained balance among tribes, religious leaders, and the central government by limiting its presence and role in the countryside and by skillful use of soft power. By way of repeating Abdurrahman's consolidation while emphasizing Zahir's co-optation, a prominent man from each manteqa should be selected as baradur ikhan (or heroic local leader in Pashto) and endowed with permanent, indivisible, and inheritable federal assets, obligations, and powers. These are intended to align the baradur ikhan, his family, extended relations, and constituents with the central government, and they then become a conduit between it and the qawm in each manteqa, facilitating the incorporation of village society over time to the state. By elevating select qawm members, providing them with federal assets (fiefs), and requiring allegiance and owed service (homage), the predominance, range of control, depth, and balance among the networked constituencies that make up village society are altered, interlinking the village with the decentralized substructure, and by extension—with the state's central superstructure. Additionally, the manteqa's fixed physical location attaches the baradur ikhan, his family, and clan to a defined geographic area they must defend if they want to retain the centrally-awarded benefits. If properly managed, the federal investiture of an individual from the manteqa and the qawm can generate a cascade of personal obligations and owed service—ultimately to the central government—from the baradur ikhan downward to his retainers in the manteqa, and horizontally through mutual support obligations to other baradur ikhans across manteqas. Decentralization also imposes an obligation on the central government, which must assist and support its representative, his family, retainers, and constituents, not intrigue against them, or reduce them to servitude. While it may specify terms and conditions for operating the fief, the government's goal is to generate a string of long-term, personal obligations from prominent individuals and families in those areas it needs to consolidate. Prior conditions on the baradur ikhan for holding and operating the fief cannot be overly constraining to ensure that federal assets are protected and operated profitably. Newly-appointed baradur ikhans in the various manteqas will play a central role in creating links between village society and the central government. It is to them that local constituents would pledge personal allegiance in exchange for profiting from centrally created assets and federal alignment. The baradur ikhan must deliver homage, military service of a specified number of retainers in battle or garrison, or service support, such as digging fortifications, carting supplies, providing arms or vehicles, etc. Additionally, the baradur ikhan must provide hospitality and food for federal representatives and attend meetings at the national level when summoned. A long-tenured baradur ikhan can provide direct, consistent, and stable civil-military representation to the manteqa. Long tenure makes it possible to fulfill cross-generational personal obligations between the central government, its subjects, and the qawm network. Without the ability to redress grievance or interface with the original, local individual guarantor or his family, neither the subject nor the qawm will risk a meaningful relationship with the central authorities. Long tenure provides consistency and stability which minimizes random shocks to the qawm and manteqa, allowing for better planning and higher societal growth with lower societal risk. Ultimately, a long tenure facilitates the evolution of baradur ikhans' individual performance into the standard for the office, laying the foundations of institutional governance. The baradur ikhan's duties as direct civil-military representative to the manteqa include territorial defense, both separately and in coordination with, but not subordinate, to the local consultative body (jurga or shura), administration of governmental goods and services, and facilitation of the government-qawm relationship. As such, the baradur ikhan would recruit and maintain a professional constabulary from local families. He would also incorporate those families, as appropriate, to his centrally-provided fiefs requiring formal homage obligations (i.e., armed support) from them to him. While there are many specific approaches, the baradur ikhan should report to the provincial governor as well as the interior ministry, be independent from district Afghan National Army and Afghan National Police elements and operate on his own recognizance under guidance from the provincial governor. The baradur ikhan's duties are not to impose central law onto the manteqa or into the qawm but primarily to conduct stability operations and maintain the peace. His long tenure and qawm interconnections ensure the firm subordination of tactical priorities, martial ideals, and warlike instincts to political goals and minimizes the misuse of force in pursuit of purely tactical goals or for the psychic rewards of purposeless victories. As a local, albeit elevated by the central government, he would operate with deep understanding and acknowledgement of local traditions. Given the inherent power of the baradur ikhan, additional governmental checks and balances, as well as constraining regional offices, should be implemented. On stability operations, the baradur ikhan reports to the provincial governor and could be removed by him with the concurrence of the Interior Ministry and the defense department. On constituency-related issues (fief, homage, allegiance), the baradur ikhan answers to a federal justice of the peace. Unless and until hostile areas are pacified, stabilized, and consolidated under central control, there is no advantage to antagonizing the qawm by introducing national police or any variant of this profoundly alien concept. This is why the baradur ikhan is different and distinct from any national police force. Beyond defeating Taliban paramilitaries and bandits, successful stability operations provide consistent, stable public order. The essential competition between the Afghan government and the Taliban may, in fact, be about who will provide public order and to what end. Given the presumption of sovereignty and the self-policing nature of the qawm, enforcing public order in Afghanistan requires the ability to maneuver among a large array of local interests. A viable approach is to facilitate the acculturation of national needs through village society's social framework into the qawm, manteqa, and shura. The baradur ikhan and his retainers, a local, permanent, federal force whose self-interest and personal survival is inextricably linked to governmental success, can operate inside the qawm to redirect and/or co-opt its mechanisms for enforcing public order to federal ends. The baradur ikhan's responsibility for regional stability offers significant military and strategic advantages, mainly by freeing the Afghan army from territorial duties. This allows the army to remain a mobile strike force, employing the psychological weight of its presence and its mobility to pacify unruly districts with economy of force measures and to avoid the heavy force protection requirements of a garrisoned force. Economically, the baradur ikhan with his intimate knowledge of both the qawm and the central government serves as an intermediary between the two. He not only satisfies the qawm's demand for government goods and services delivered at the right place, quantity, quality, and price but also stimulates demand through promotion, time, place, safe storage, and transport. In other words, a central government delivering a generic selection of non-priced goods and services on an ad hoc basis to a qawm will see those goods and services co-opted by local interests for local purposes. By contrast, the baradur ikhan matches the assortment of governmental goods and services to the market, sees that they are properly transported to where the market can gain access to them, or stored until they are ready for use, and exchanged for money, goods, or services. As an intermediary channel, the baradur ikhan also regularizes the transaction by standardizing the ordering, as well as valuing and paying for goods or services between the central government and the qawm. As the trade-relations mix is fulfilled by completed transactions between the government and the qawm, trust is created between the local and national institutions. Cross-border sanctuaries present a challenge to any state. In theory, states either respect sovereign borders or declare war in order to violate them. On the ground, weak or failed states may be unable to control their borders, pursue national strategy asymmetrically through deniable proxy forces, or find it expedient to allow restive minorities to become a neighbor's problem. To fight the Taliban and its allies in their Pakistan sanctuaries, the Afghan government could make use of ghazis—semiautonomous warlords operating as a vanguard for the central government—who would focus on expansion into contested areas and sanctuaries outside the operative Afghan state. These ghazis could conduct limited campaigns in hostile or contested Pashtun territories with a view to confederating independent manteqas and tribes and consolidating hostile manteqas under their authority and de-facto Afghan central control. The ghazis must be co-opted, controlled, and counterbalanced in order to preclude competition with the state. U.S. funding, logistical and combat support, as well as air power and special forces support are all available counterbalances. Shifting support among competing ghazis could reinforce dependency on U.S. and allied forces. Upon successful societal reformulation of confederated or consolidated populations, the ghazis will have to be incorporated into the Afghan state institutions through "acts of union" granting equal rights to those populations through locally arbitrated rather than centrally appointed representation. The war in Afghanistan is both nativist and sectarian. Any viable strategy must engage and defeat the Taliban in both. As an alien implant in a predominantly Hanifi Sunni society, armed Salafism in Afghanistan has exploitable weaknesses. For one thing, its doctrinarian oppressiveness creates an enormous resource drain and places Salafism in opposition to many preexisting local constituencies and natural societal forces. For another, despite its atavistic yearning for the restoration of an idealized past, Salafism is a modern movement that lacks historic weight compared to traditional Islam. The Taliban, in particular, are poorly tutored in Islamic and Afghan history and have rudimentary familiarity with the Qur'an and the Shari'a (Islamic law), not to mention political and theoretical developments in the Muslim world during the twentieth century. This in turn leaves them exposed to numerous counter-strategies. It is possible, for example, to exploit Salafism's doctrinal characteristics and tendencies to wedge it away from and render it foreign to Afghan society, then use that foreignness to invoke an immune response from natural components of that society. It may also be possible to enhance and intensify existing schisms between doctrinal purist Salafists and their more pragmatic and less theological jihadist counterparts until the local movement collapses—an approach that was successfully employed in Chechnya and Algeria where the Armed Islamic Group's methods were so violent as to be questioned by some Salafi clerics. While both counter-strategies are feasible, the "foreignness" approach is most accessible and universal. Initially, Salafi sects must be denied a local foothold by the development and deployment of wedge issues that separate them from traditional, local village society. These can range across numerous sectarian, ethnic, and national divides as the Pakistani military attempted to wedge the Ahmadzai Wazir and Meshud Taliban factions apart in Waziristan. Ultimately, the theocratic case against Salafi Islam can be made and formalized in religious rulings (fatwas) issued by respected Pashtun ulema, something that should not be too difficult given the Taliban's low level of religious knowledge. Once the divide is drawn between Salafism and local, traditional Islam, the historical weight and resources of local religion must be mobilized for challenging Salafism for grassroots control of the mosque, imam, and ulema. Imams can be recruited to report on parishioners who challenge traditional doctrine. Parishioners can seize the religious endowments of radicalized mosques or the mosques themselves. Establishing an affiliated, rural Hanafi Islamic madrasa (school) system, providing a local center of gravity for community-based social services, job training and placement, youth recruitment and education, all within preexisting qawm and manteqa structures provides another avenue for challenging Salafism. As with radical Islamic schools, these madrasas should be free of charge and driven by missionary zeal. As such, they should be able to attract vetted and trained ulema and clerics as well as the brightest and most ambitious students since official recognition of their diplomas would provide a safe and lucrative avenue to government employment and social services. Such a system can provide a means for reinforcing and defending local religion's position within the village social network while driving Salafism outside it. It employs the same method used to install Salafism in the Pashtun areas of Pakistan's Northwest Frontier Province and Baluchistan during the 1980s but to opposite effect. For example, emphasizing the differences between Pashtunwali and Salafi interpretations of the Shari'a can create internal contradictions for Salafi Pashtuns, forcing them to choose between being good Pashtuns and good Salafis. Likewise, the employment of local ulema and mullahs provides them with a material incentive to spread the message within village society. At a minimum, it co-opts local religious resources and prevents their co-optation by others. Affiliation among local madrasas aids information flow and facilitates rapid response. Coupled with provincial associations for regional ulema and mullahs for additional education, specific services, and mutual defense, the system creates a religious critical mass competing directly with Salafi Islam—all without direct government presence. The outcome is a coherent distribution channel for a competitive Pashtun Hanafi religious model where the individual adherent can be both a good Pashtun and a good Muslim as opposed to the Salafi model that rejects traditional Pashtun social structure. A competing madrasa system can also attack a critical vulnerability of armed Salafi movements by aggressively vying with them for new recruits. This could, in turn, limit the Taliban's ability to replace its combat losses, shrink its available pool of manpower, and drive up its labor costs. The confluence of these factors may cascade through to Taliban combat operations, reducing tempo, decreasing range, changing tactics and focus. If successful, a competing madrasa system should provide theological shock troops matching the Taliban's religious zeal and exceeding them in religious education. The end result would be an equal and opposite self-organized, armed, extra-tribal, sectarian force fundamentally opposed to the Taliban. There are other minority sects in Afghanistan and Central Asia that can buttress the sectarian war against armed Salafism, notably the Sufi movement, which in many ways embodies the antithesis to Salafism. Its incorporation of local beliefs and variations of practice falls into the sinful category of Bid'a, or religious innovation after Islam's first generations; its veneration of saints, visitation of tombs, celebration of the Prophet Muhammad's birthday, all violate tawhid—the uniqueness and unity of God—by revering anything other than God. Sufism's propensity to regionalize, acculturate, and seek economic uplift imbues it with the ability to create combined religious-ethnic-economic wedge issues. As such, it can offer an advantageous religious model for Pashtuns versus Salafism and be successful in competing for new adherents. Establishing Sufi centers or cloisters with schools in border regions introduces a strategic, sectarian challenge to the Salafis. Sufism in Chechnya operates in a military-style cell structure. This could easily be imported to Afghanistan. In hostile locations, Sufism operates underground schools, and the combination of military organization and tendency to secrecy may allow for strategic penetration of Salafi areas. Indeed, the Russians began using Sufism as a counterbalance to Salafism in 1996 under Chechen president Aslan Maskhadov, and the idea of promoting Sufism as a counterbalance to Salafism is gaining currency in some U.S. defense-related think tanks, such as the Rand Corporation and the Heritage Institute. Given their inclination to oppose foreign occupation, Sufis fought alongside Salafis and Baathists against U.S. forces in Fallujah in 2004, and this factor may limit their strategic employment. However, Sufi expansions into Salafi areas will undoubtedly induce Salafi attacks, which could in turn provide the impetus for armed Sufi response. Moreover, the use of Afghan non-Salafi sects, like the Sufis, directly challenges Salafi claims to sacred legitimacy, fragments their attempts to organize village society, and plunges those areas under Salafi control into destructive, internecine, sectarian war. Finally, the newly-appointed ghazis could be induced to support the Hanafi system and Sufi monasteries so as to introduce religious competition at the local level in harmony with, but not a direct component of, the decentralized system. On a wider level, local patriotism can reinforce the sectarian wedge. A Pashtun cultural renaissance will compete with radical Islam as a societal motivator and organizer. A Pashtun cultural renaissance, distributed as an ethnic-tribal component of a federally-funded, religious-educational system, could support the establishment of specifically created local groups. In addition to providing cultural identification, these groups could become natural competitors, promoting and distributing indigenous dogma with positive or punitive scope on issues, including Pashtun tribal history, politics, and genealogy. Their grassroots patriotism could fuel rejection of foreign concepts such as Wahhabism and the individuals and groups carrying it. Pashtun patriotism could be a means to isolate and drive out foreign, non-Pashtun radicals and their religious concepts. It could directly attack the linkage between non-traditional, non-local Islamic jurisprudence and militarism. Tracking, targeting, and locating foreign militants would be consistent with such groups and highly useful to U.S. intelligence. Promoting low intensity conflict between the proponents of Pashtun patriotism and foreign-derived Islamic militarism could shut down the pipeline of foreign recruits coming to centralized training facilities. This would force Islamic radicals to expend resources replicating training bases in each locale where they seek to operate. Religious and ideological motivators provide the will. Political and cultural organizations provide the force. Economic programs provide the staying power. The goal of a national logistics system is to compete for tribal affiliation, based upon standard of living. National logistics programs conducted at the district level must be delivered as a package of goods and services only to clans willing to affiliate or ally with the national, provincial, and district governments or their representatives, such as the baradur ikhan. Goods or services must not be delivered to clans of suspect loyalty or to those unwilling to make a substantial, up-front commitment. This would be counterproductive and could, in fact, serve to aid and abet national self-destruction. The tribes who ally will win and expand; those who oppose will lose and contract. U.S. allied forces would be the arbiters of the difference. The advantage of a basic, franchised package of goods and services is efficient delivery, comprehensive program control, coherence of government support at the district level, and ease of replication. Forces such as demographic, industrial, agricultural, distribution, and communications make the strategic offensive possible but are often overlooked in war planning because they do not generally require soldiers. Replacing U.S. soldiers with local nationals and tribal-based logistic programs can be a tremendous force multiplier. The national logistic program must generate measurable, positive results for allied clans, qawm, and manteqa. Demographic programs such as public health, field medical, and midwifery-based prenatal and childbirth programs would need to enhance the birthrate, decrease infant mortality, and increase life expectancy for allied clans. The cumulative result is to engineer a higher growth rate for clans opposing radical Islam, rather than for those supporting it. The net effect, and strategic goal, is to create a multigenerational, in-place tribal army, and an allied population that would grow faster and live longer than radical Islam's supporters. Industrial economic programs may include the creation of specialized guilds to establish, train, and support a myriad of manufacturing, mining, and engineering activities. For example, a federal fief delivered to a government allied manteqa could be a man-powered, machine shop for metal and wood parts manufacture, complete with a district manufacturing contract. The provincial governor and interior ministry would determine which allied family receives it in exchange for becoming a baradur ikhan. The regional manufacturing guild council would then be responsible for setting it up, training guild members, and getting the manteqa into operations. Specialized guilds have the advantage of being self-organizing, self-motivating, and self-maintaining. They could be used to seed and support industrial activity in allied families and across the nation. This would develop, if not create, local economies. Guild-generated industrial specialization would create local economies with greater efficiency, diversification, and resilience. Industrial finance programs could include micro-finance for village-based businesses, guild-based businesses, and women- and minority-based businesses. The net effect and strategic goal is to create more prosperous societies, capable of supporting larger, denser populations, full-time law enforcement, and civil defense capabilities. Agricultural programs may include seed banks, production, distribution, and sales cooperatives as well as district and provincial level consulting. These programs would be measured by the comparative increase in calories per day provided to allied or affiliated families and tribes, versus those supporting radical Islam. The net effect and strategic goal would be to create larger, higher density, better fed populations with a lower incidence of illness due to dietary deficiency. Distribution programs make use of transportation, roads, bridges, fuel, fleet management, etc. The ability to move material, military, and allied populations may become the most important lever of pacification in Afghanistan. Targeted population growth could be the ultimate arbiter of sovereignty, displacing those who oppose the government with those who support it. The control and reformulation of Pashtun societies, two components of victory, are in many ways prepped by military, political, and religious initiatives and fueled by economic programs riding national distribution grids into the societal battle-space. The geographic coherence of economic programs is facilitated by the physical distribution grid. Perceptual coherence is facilitated by the introduction of a new communications grid distributing intellectual property. Creating and distributing a low cost, suitably engineered smart phone for disseminating information, intelligence, and knowledge to locals in hostile regions via one-to-one conversations, party-line discussions, and one-to-many broadcasts preps the intellectual battlefield for further government initiatives. This grid also serves as a platform for collecting visual, audible, text, and other information from locals in hostile regions allowing the coordinating authorities to sequence and calibrate future actions. Distributive, economic, religious, and military initiatives are the means of achieving victory in Afghanistan if expressed through naturally occurring enemies of armed Salafism. The strategic intent is to destroy Salafist military capacity, seize control of Pashtun populations under Salafism's grasp, and reformulate those societies so that they ally with the government and reject radical Islam. A multigenerational, allied, in-place, Pashtun tribal society and paramilitary is the most efficient means of conducting a comprehensive, strategic offensive that matches radical Islam's advantages of permanence, religious and tribal will, local knowledge, language and culture. The allied Pashtuns' lives must be measurably superior to radical Islam's Pashtun supporters and opposed to them as a matter of politics, culture, religion, and ideology. The rise of armed Salafi Islam has been a generational phenomenon. Washington can succeed by moving off the strategic defensive and launching a comprehensive, coherent, and generational strategic offensive against Salafi Islam in Afghanistan and Pakistan's Pashtun majority provinces. The requirements of U.S. strategy are to engage and destroy core enemy forces decisively, seize populations, and break the enemy's willpower. U.S. strategy must, therefore, be comprehensive to allow for the use of any tool to achieve victory, across the spectrum from societal competition to armed force, and must also be coherent, harnessing all individual outcomes from agricultural and ideological competition to military conflict. The U.S. strategic offensive against armed Salafi Islam must match its advantages of terrain, tribal and cultural knowledge, language, birth rate, and permanence. In order to be practical and efficient across multiple generations, it should be self-organizing, self-maintaining, and self-replicating. Victory in Afghanistan will manifest in the creation of a multigenerational, in-place, Pashtun village society with a paramilitary and population whose lives and work are measurably superior to Salafi Islam's Pashtun supporters and that opposes them as a matter of politics, culture, religion, and ideology. David Katz is a West Point graduate, former Green Beret captain, and Silicon Valley entrepreneur. He formed DaraCom to facilitate the strategic use of twenty-first century technologies to communicate effectively with unconnected or nontechnical individuals and communities throughout the world. The Washington Post, Oct. 7, 2001. "The National Security Strategy, September 2002," The White House, chap. III, p. 2. "Security Council Authorizes International Security Force for Afghanistan," resolution 1386, United Nations, New York, Dec. 20, 2001. "Tora Bora Revisited: How We Failed to Get Bin Laden and Why It Matters Today," report to U.S. Senate, Committee on Foreign Relations, 111th Congress, Washington, D.C., Nov. 30, 2009. "Key Facts and Figures," International Security and Assistance Force, North Atlantic Treaty Alliance (NATO), accessed Dec. 14, 2010. "ISAF Regional Command Structure," International Security Assistance Force, NATO, Oct. 22, 2009. "The Pakistan Reproductive Health and Family Planning Survey (PRHFPS)," National Institute of Population Studies (NIPS), Islamabad, 2001, p. 48. "Afghanistan Statistics," UNICEF, New York, 2008, accessed Feb. 7, 2011. The Washington Post, July 3, 2009. Gen. David H. Petraeus, statement before the Senate Armed Services Committee, Washington, D.C., Apr. 1, 2009. Shahmahmood Miakhel, Understanding Afghanistan: The Importance of Tribal Culture and Structure in Security and Governance (Washington, D.C.: U.S. Institute of Peace, 2009), p. 2. Raphy Favre, "Interface between State and Society in Afghanistan," Aizon, Addis Abeba, Feb. 2005, pp. 5-8. The New York Times, Mar. 11, 2010. Miakhel, Understanding Afghanistan, p. 21. Seth Jones, "Community Defense in Afghanistan," Joint Forces Quarterly, 2nd Quarter, 2010, p. 11. Edward Luttwak, The Grand Strategy of the Roman Empire (Baltimore: Johns Hopkins University Press, 1979), p. 2. Thomas Blau and Daryl Liskey, "Analytics and Action in Afghanistan," Prism 1, Sept. 2010, pp. 42-5. Philip Kotler, Marketing Management: Analysis, Planning, Implementation and Control (Englewood Cliffs, N.J.: Prentice Hall, 1988), pp. 529-32. See a similar idea in Robert Bartlett, England under the Norman and Angevin Kings: 1075- 1225 (Oxford: Clarendon Press, 2000), p. 73. Ahmed Rashid, Taliban (New Haven: Yale University Press, 2000), p. 93. Quintan Wiktorowicz, "The New Global Threat: Transnational Salafis and Jihad," Middle East Policy, Dec. 2001, pp. 25, 30. Mona Kanwal Sheikh, "Disaggregating the Pakistani Taliban," Danish Institute for International Studies Brief, Copenhagen, Sept. 2009, p. 5. Olivier Roy, "Islamic Radicalism in Afghanistan and Pakistan," U.N. High Commissioner for Refugees (UNHCR), Emergency and Security Service, Jan. 1, 2002, p. 11; S.J. Malik, "Dynamics among Traditional Religious Scholars and Their Institutions in Contemporary South Asia," The Muslim World, July-Oct. 1997. Mary Brill Olcott, "Sufism in Central Asia: A Force for Moderation or a Cause of Politicization?" Carnegie Endowment for International Peace, Russian and Eurasian Program, Washington, D.C., May 2002, p. 1; Wiktorowicz, "The New Global Threat," p. 20. Mairbek Vatchagaev, "The Role of Sufism in the Chechen Resistance," North Caucasus Analysis, Jamestown Foundation, Washington, D.C., Dec. 31, 1969. Olcott, "Sufism in Central Asia," p. 16; Reuters, June 26, 2009. Rafid Fadhil Ali, "Sufi Insurgent Groups in Iraq," Terrorism Monitor, Jamestown Foundation, Washington, D.C., Jan. 25, 2008. Related Topics: Central Asia | Spring 2011 MEQ receive the latest by email: subscribe to the free mef mailing list This text may be reposted or forwarded so long as it is presented as an integral whole with complete and accurate information provided about its author, date, place of publication, and original URL.